The wave of dead lodgepole and whitebark pine has mostly passed in the Sawtooth National Recreation Area (SNRA). However, the primary reason is that most of the pine are now dead. The epidemic began just downriver from Stanley, Idaho in the late 1990s. While the Forest Service tried cutting affected trees and also did proactive thinning, it did little to stop the epidemic. The Service’s “red tree” program (named after the color of the pine needles when the tree first dies) helped reduced the fire danger to residences somewhat, but the mountain pine bark beetles moved on just like they almost always do until a very cold winter stops their march. What happened in the SNRA is currently taking place on a much larger scale in British Columbia and now Alberta. No amount of logging can keep ahead of the die-off. The end result will be big forest fires. These will renew the forests unless the climate has changed making the area too hot or dry for lodgepole pine. Lodgepole regenerates easily because the cones lie in the shade for years and, which one kind of exception, open only when exposed to direct sun or fire. Whitebark pine is not so fortunate because is grows on the high slopes, just below timberline, where growth is slow under the best conditions. 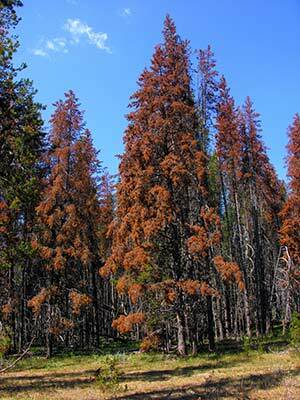 It is also beset by whitebark pine blister rust, an exotic fungal disease. The Idaho Mountain Express recently wrote of the epidemic wave. Mountain pine beetle slows down. years-long infestation is past its peak, forester says. By Greg Stahl. Idaho Mountain Express Assistant Editor. The red trees are explosively flammable. You can light their needles when they are soaking wet! However, after about one year the red needles drop off. The bare, dead lodgepole are not explosively flammable, but the burn easily. In those case where fire does not come through, young lodgepole will sprout in the sun under the dead trees. 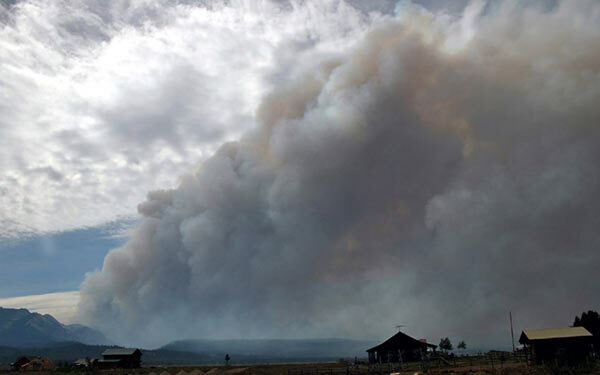 The likelihood of a large fire down in the forested parts of the Sawtooth Valley and Stanley Basin will persist for years. The forest will come back one way or the other, except if climatic conditions change so a forest can no longer grow in the area. Red lodgepole pine in the Sawtooth National Recreation Area. A major fire burned up the backside of the Sawtooth Mountain range last summer and almost burned into Stanley Basin. The plume of the Trailhead Fire from summer of 2006. Photo copyright Lynne Stone.